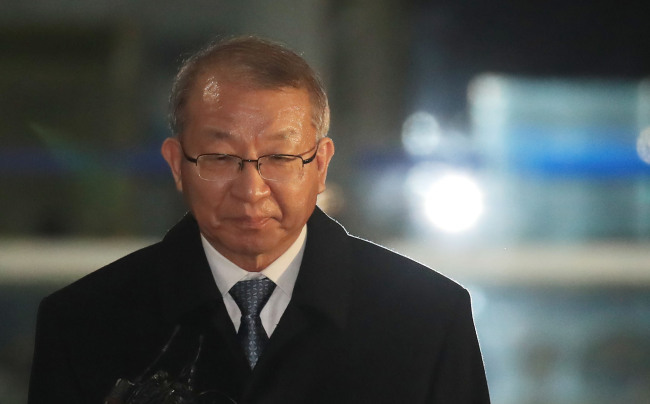 The prosecution’s decision on whether to seek an arrest warrant for former Supreme Court chief Yang Seung-tae appears likely to be pushed back, with Yang continuing his marathon review of the records of his interrogation. Yang, who is under investigation over power abuse allegations, has been questioned by prosecutors on three occasions, with the latest taking place Tuesday. In the latest questioning, investigators quizzed Yang on allegations that he created a slush fund from the budgets of the lower courts’ public relations departments. Following the latest questioning session, which took place Tuesday from 9:30 a.m. to 2 p.m., Yang reviewed the records of the previous session until 11 p.m., according to the prosecutors’ office. The records Yang reviewed Tuesday are said to be those from his second and third questioning sessions. Under local regulations, a suspect is able to review the records of a questioning session with a lawyer present to ensure that the records are accurate and that no statements are taken out of context. Despite having spent nine hours reviewing the records, compared to less than five hours undergoing questioning, Yang did not complete the review and plans to resume the process later in the week. Yang was first questioned on Jan. 11, becoming the first former Supreme Court chief justice in Korean history to be summoned as a suspect by the prosecution. Following the questioning, Yang spent 13 hours reviewing the records on the day of the questioning and the following day. During the first session and Monday’s second session, the prosecution questioned Yang on allegations that he influenced trials concerning Koreans who were forced to labor during Japan’s occupation of Korea in the first half of the 20th century, and the trial concerning the now- defunct Unified Progressive Party. Yang, who headed the Supreme Court during the Park Geun-hye administration, is accused of having interfered with politically sensitive trials to curry favor the presidential office, in a bid to further plans to establish a new appeals court. Yang was also grilled over allegations that a blacklist of judges was compiled under his orders, and that the Supreme Court illegally gathered classified information from the Constitutional Court.